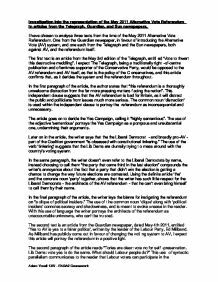 Investigation into the representation of the May 2011 Alternative Vote Referendum in articles from the Telegraph, Guardian, and Sun newspapers. I have chosen to analyse three texts from the time of the May 2011 Alternative Vote Referendum. 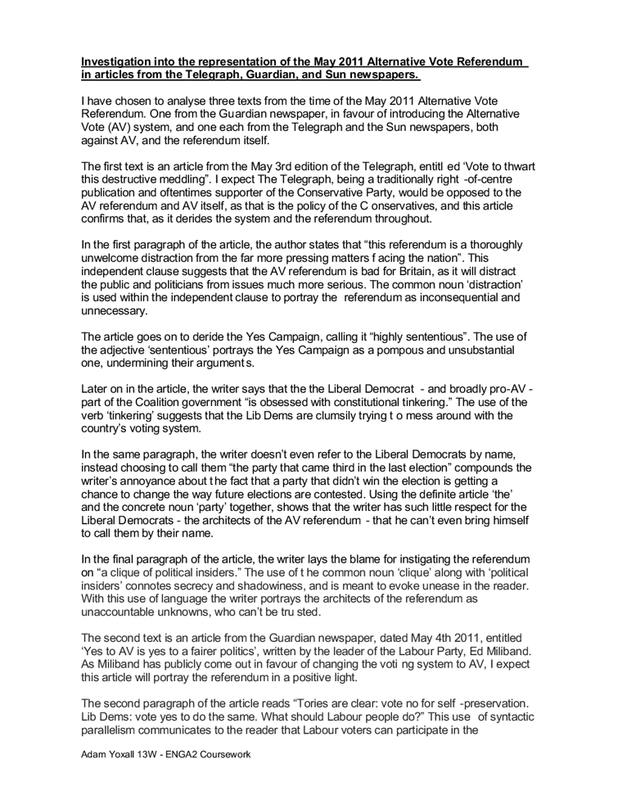 One from the Guardian newspaper, in favour of introducing the Alternative Vote (AV) system, and one each from the Telegraph and the Sun newspapers, both against AV, and the referendum itself. The first text is an article from the May 3rd edition of the Telegraph, entitled ‘Vote to thwart this destructive meddling”. I expect The Telegraph, being a traditionally right-of-centre publication and oftentimes supporter of the Conservative Party, would be opposed to the AV referendum and AV itself, as that is the policy of the Conservatives, and this article confirms that, as it derides the system and the referendum throughout. In the first paragraph of the article, the author states that “this referendum is a thoroughly unwelcome distraction from the far more pressing matters facing the nation”. This independent clause suggests that the AV referendum is bad for Britain, as it will distract the public and politicians from issues much more serious. The common noun ‘distraction’ is used within the independent clause to portray the referendum as inconsequential and unnecessary. The article goes on to deride the Yes Campaign, calling it “highly sententious”. The use of the adjective ‘sententious’ portrays the Yes Campaign as a pompous and unsubstantial one, undermining their arguments. Later on in the article, the writer says that the the Liberal Democrat - and broadly pro-AV - part of the Coalition government “is obsessed with constitutional tinkering.” The use of the verb ‘tinkering’ suggests that the Lib Dems are clumsily trying to mess around with the country’s voting system. In the same paragraph, the writer doesn’t even refer to the Liberal Democrats by name, instead choosing to call them “the party that came third in the last election” compounds the writer’s annoyance about the fact that a party that didn’t win the election is getting a chance to change the way future elections are contested. Using the definite article ‘the’ and the concrete noun ‘party’ together, shows that the writer has such little respect for the Liberal Democrats - the architects of the AV referendum - that he can’t even bring himself to call them by their name. In the final paragraph of the article, the writer lays the blame for instigating the referendum on “a clique of political insiders.” The use of the common noun ‘clique’ along with ‘political insiders’ connotes secrecy and shadowiness, and is meant to evoke unease in the reader. With this use of language the writer portrays the architects of the referendum as unaccountable unknowns, who can’t be trusted. The second text is an article from the Guardian newspaper, dated May 4th 2011, entitled ‘Yes to AV is yes to a fairer politics’, written by the leader of the Labour Party, Ed Miliband. As Miliband has publicly come out in favour of changing the voting system to AV, I expect this article will portray the referendum in a positive light. The second paragraph of the article reads “Tories are clear: vote no for self-preservation. Lib Dems: vote yes to do the same. What should Labour people do?” This use of syntactic parallelism communicates to the reader that Labour voters can participate in the referendum, too, and that they don’t have to side with either the Conservatives with a no vote, or the Liberal Democrats with a yes vote. The noun phrase ‘Labour people’ is used extensively throughout the article to refer to people who vote Labour, ostensibly to include the audience, who - due to the Guardian being a left-wing publication - will likely be made up of many Labour supporters. Miliband includes uses language to include the audience, as he’ll be more likely to bring people around to his point of view (that the referendum is a good thing, and that people should vote yes) by doing so. In the third paragraph, Miliband writes “ I say vote yes because it supports the kind of politics we should want: fairer, more pluralist and more progressive.” Using triplets in this way is meant to convince the audience that the Alternative Vote system is a good thing, and embodies the kind of political values that many people stand for, consequently portraying the system and referendum in a good light. Miliband uses statistics liberally in the article to get his point about the virtues of AV across. He says that the last election was decided by “just 1.6% of the electorate” and claims that “two thirds of MPs are now elected with fewer than 50% support”. In going on to say that AV would combat these designed-to-shock statistics, he portrays it as a much fairer and more democratic system than the current implementation of first-past-the-post, and in doing so, represents the AV referendum as being a once-in-a-lifetime chance for Britain to change from an unrepresentative system, to one that puts more power in the hands of voters. The third and final text is an article from the Sun newspaper from May 5th 2011 entitled ‘No alternative’. As the Sun is a right-wing tabloid, and has stated its support for the Conservative Party, who oppose AV and the referendum, I expect this text to represent it negatively, like with the Telegraph article. The writer almost immediately uses syntactic parallelism, when in the second paragraph, they say “One person. One vote.” This describes the current system of first-past-the-post, which contrasts with the proposed AV system, which many people - including, clearly, the writer of this article - claim allows people multiple votes. In portraying the current system as much simpler and fairer, the writer makes the Alternative Vote system look complicated and unfair. Adjectives are used to great effect in the third text to disparage the Alternative Vote system, the referendum on its use, the effect a yes vote would have on the UK, and the politicians who instigated the referendum. The writer calls supporters of AV ‘fanatics’ - an adjective often saved for people who are in favour of radical and damaging policies, which portrays the Alternative Vote as just that - radical and damaging. The use of ‘catastrophe’ in the dependent clause “If you want to save Britain from catastrophe” reinforces the view that AV would be incredibly damaging to the country, and therefore a referendum making such a system possible is an extremely bad idea. My analysis of the three texts shows the various different views the print media has on the Alternative Vote Referendum. Many publications, like the Sun and the Telegraph are vehemently opposed to it, whereas others, like the Guardian welcome it. They use language in creative and intelligent ways to portray the referendum as either damaging to Britain, or intrinsically a good thing for the country. Due to the divisive nature of the issue, newspapers and the wider media are destined to go on debating the referendum long after the result has been announced. Text 1 - ‘Vote to thwart this destructive meddling’ - an article taken from the Telegraph newspaper, published May 3rd 2011. Tomorrow, a referendum that few people want will be held on whether to change a voting system that most people would like to keep. Opinion polls show that a clear majority of the electorate wish to retain the first-past-the-post method of choosing MPs, and oppose its replacement with the Alternative Vote. Nor has there been any great demand for reform. Far from it: the political party that has been the most consistent and vocal advocate of electoral reform obtained less than a quarter of the vote last May. If anything,this referendum is a thoroughly unwelcome distraction from the far more pressing matters facing the nation. To listen to the Yes lobby, however, is to be left with the impression that all right-thinking people must consider the current system a blot on the face of democracy. This is just one of the outlandish arguments its members have made duringa highly sententiouscampaign. And what has made the moralising even harder to swallow is that the chief supporters of AV do not like it much themselves, seeing it as a poor substitute for “proper” proportional representation: Nick Clegg called it a “miserable little compromise” as recently as last year. We are having this referendum because the party that came third in the last election, and which forms part of the governing Coalition, is obsessed with constitutional tinkering, from which it hopes to benefit electorally. This is utterly self-serving. While first-past-the-post is not perfect, it is simple to grasp and tends to produce strong and accountable government. AV will increase the likelihood of indecisive elections, permanent coalitions, back-room deals and opportunities for the tail to wag the dog. Moreover, in making the case for change, the Yes campaign has been incoherent and unpersuasive, resorting to grotesquecalumnies, such as Chris Huhne’s invocation of Goebbels. Indeed, after his performance over the past few days and weeks, Mr Huhne may wish to consider his position. While we may consider this referendum to be a wretched imposition foisted on the country by a clique of political insiders, the danger is that they could yet win by default. David Cameron’s refusal to support a House of Lords amendment requiring a 40 per cent turnout to validate a Yes vote has left the outcome uncertain. Reformers are more likely to take part in the referendum than those who don’t care or are content with the existing system. It is important, then, that all those opposed to AV go to the polls – and that a resounding No vote puts a stop to the other constitutional upheavals envisaged by the Lib Dems, and enables the country to focus on what matters. Text 2 - ‘Yes to AV is yes to a fairer politics’ - an article taken from the Guardian newspaper, by the Labour leader Ed Miliband, published May 4th 2011. "What should we do on AV?" may not exactly be the question gripping the whole nation, but it is one exercising many people on the centre-left, particularlyLabour people, just now as we approach tomorrow's referendum. Tories are clear: vote no for self-preservation. Lib Dems: vote yes to do the same. What should Labour people do? I respect my colleagues who would argue for no, but I think they are wrong. Instead, I say vote yes because it supports the kind of politics we should want:fairer, more pluralist and more progressive. The right starting point is to ask why we should change a system that has remained pretty much unaltered since the extension of universal suffrage in 1928. In the intervening years, first past the post has been abandoned by all the major political parties in Britain for electing its leaders. And only three post-war democracies have introduced this system – Albania, Macedonia and Ukraine – and even they later decided to reform it. Time and democracy have moved on but Britain isstuck in the past with an outdated first-past-the-post way of electing MPs, which does not serve us well. In a more splintered electorate, it is a system where two thirds of MPs are now elected with fewer than 50% support, and where many people's votes do not count in safe seats. At last year's general election, this meant the result was decided by fewer than 460,000 voters –just 1.6% of the electorate – in 111 marginal constituencies. That is, by any reasonable standard, unfair. AV is not a proportional system, it is true. But it is the best way of retaining one MP, one constituency, making MPs seek more than 50% of the vote and making more people's votes count. I believe reforming the system with the alternative vote will also be a step towards improving our arid and divisive political culture. Under the old system, there is no motivation for parties to go into elections pretending anything other than that they hate each other equally. No reason to find points of common ground; just to disagree. To secure a majority of votes under AV, candidates will need to be more frank about points of agreement, less keen to build up artificial arguments. Is this about more coalitions? Not necessarily. It is about the way we conduct political debate between and before elections, and whether we claim that all political wisdom resides in one party. Or whether we are willing to reach out. Finally, the old system has not served the cause of progress. Britain is not a Conservative country but we have had more than our fair share of rightwing governments over the past century. Let's not forget. Margaret Thatcher never secured the support of a majority of people in this country. Indeed, many of us believed a majority of the country were against her. But she was allowed to force extremely divisive policies through parliament that did lasting harm to so many communities. A yes vote is not about re-running past elections but it is about asking ourselves whether we want to persist with a system that could allow a Conservative majority on a minority vote. It is no wonder that David Cameron and George Osborne are so desperate to defeat reform in this referendum. Nor is it a surprise that tactics of fear and smear deployed by the Conservatives in the no campaign embody the characteristics of the old-fashioned politics we are seeking to change. Labour has always been at its best when it has been a force for political reform. A yes vote would, above all, reflect confidence that there is a genuine progressive majority in this country. The fear of some no campaigners on the Labour side is that we entrench a rightwing government like the current one. But I believe that is too pessimistic about the preferences of people. If you believe this is a big C Conservative country then perhaps you will believe that, when forced to choose and elect someone with more than 50% of the vote, it will aid the right. But if you believe that this is a genuinely progressive country, then we need an electoral system that can reflect the views of the electorate and give expression to the anti-Conservative majority. AV would do that. That is why I am proud to say yes to fairer votes, yes to better politics and yes to a system that reflects the progressive majority in Britain. Text 3 - ‘No Alternative’ - an article from the Sun newspaper, published May 5th 2011. THEY are the four most important words in the history of democracy. Today, that fundamental principle stands in peril. By tonight, unless enough of us vote NO, our voting system will be destroyed and replaced by a squalid muddle that will turn Britain into a political banana republic. Why is this happening? Because last year, as part of the Coalition deal, Nick Clegg's Lib Dems won the right to have a referendum on dumping our first-past-the-post system for something called the Alternative Vote - AV, for short. Instead of putting an X against one candidate, you would be asked to rank them all in order of preference. Why is Nick Clegg so keen on AV? Because it would turn Lib Dems - who include some of the most two-faced and unprincipled charlatans in Britain - into kingmakers. How? Under first-past-the-post, all votes count equally and the candidate with the most votes wins. That leads to clear-cut election results. But under AV, the sacred principle of one person, one vote is thrown in the gutter. Some votes would be counted a second, third or fourth time - or even more - until losing candidates ended up winning. No wonder Lib Dems are so keen! Permanent coalitions would replace decisive leadership. Hung parliaments and shabby backroom deals would be the norm. Bold, conviction politicians on both Tory and Labour sides would lose out to nonentities whose only ambition was to cling to power. There is another danger. AV would help extremists like the BNP. It would also make it hard to ditch bad governments. Under AV, Gordon Brown would still be in power. Our democracy is the envy of the world. It is exactly what Arab nations are fighting for. Yet we are being asked to dump it for a system so despised that only three countries in the world use it. Once voters understand the complexities of AV, most reject it. But AV can still sneak in today. The pro-AV fanatics are sure to vote. They'll be banking on everyone else staying home. The Sun understands that plodding to a polling booth is not much fun. But you will be voting to save Britain as we love it. AV is a lousy, cheating, unscrupulous and worthless way of electing governments. If you want to save Britain from catastrophe, go out today and vote NO. Spelling- conservative or liberal in Scandinavia? Michael Howard also does this, for example, "Power has gone from Britain to Brussels." His use of simple sentences reflects his wish to be perceived as truthful. He uses simple sentences therefore for clarity of speech and to prevent himself from misleading his audience. Text A swaps between the name Chris Brown and the proper noun Brown. They use Chris Brown once which is in the second paragraph which is explaining how the situation escalated, they do this by reporting how Rihanna intercepted a text message from a former Chris Brown girlfriend. Grammar: * Pronouns In his inaugural address, he very rarely, apart from his introduction, uses the pronoun "I". He uses it only three times in total, all of which coming very early in the speech. This implies that he is not intending to take control by himself, and that he would need the help of all the people. I will look at the status, purpose, context and audience for each transcript and analyse each topic accordingly. I am also going to look at the 6 frameworks - lexis, semantics, phonology, graphology, grammar, discourse, pragmatics and the sociolinguistics which has been defines as the study of language in its social context. Howard Giles carried out a similar study using RP and non-standard regional accents in England. RP speakers were rated more highly in terms of intelligence and ambition, though lower in terms of sense of humour and talkativeness. It is certainly true that as part of our 'language wardrobe', most people tend towards an RP accent in formal situations. This also including three territories, which are largely self-governing without having acquired full independence: Greenland and the Faroe Islands, which are both under Danish sovereignty and the �land Islands, which are under Finnish sovereignty. Scandinavia makes use of both a conservative and liberal combination of grammatical approaches to spelling. Both texts use embedded quotes like "It is...breakfast accommodation" to use the mentioned articles' words against the writers of the articles. It is very effective as it emphasises the strong points of view which all of the writers have. They also both begin with the word "Sir" followed by a colon in order to sound formal and professional.